North Korean leader Kim Jong-un was given a state welcome during his secretive two-day visit to Beijing earlier this week. Although protocol fell short of the one received by his father, Kim Jong-il, Kim Jong-un was given a higher level of hospitality than South Korean President Moon Jae-in during his trip last December. 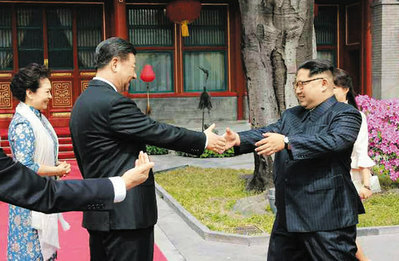 Kim Jong-un was greeted by three members of the Communist Party's Politburo Standing Committee: President Xi Jinping, Premier Li Keqiang and Wang Huning, a policy adviser to Xi. Moon only met Xi and Li. Welcoming Kim at Beijing railway station on Monday were Wang, Song Tao, the head of the party's International Liaison Department, Chinese Ambassador to North Korea Li Jinjun and other high-level officials. When Moon arrived, China just sent an assistance vice minister and the Chinese ambassador to South Korea to greet him. Xi also treated Kim to a state banquet on Monday evening and a Chinese opera performance like during the state visit by U.S. President Donald Trump. 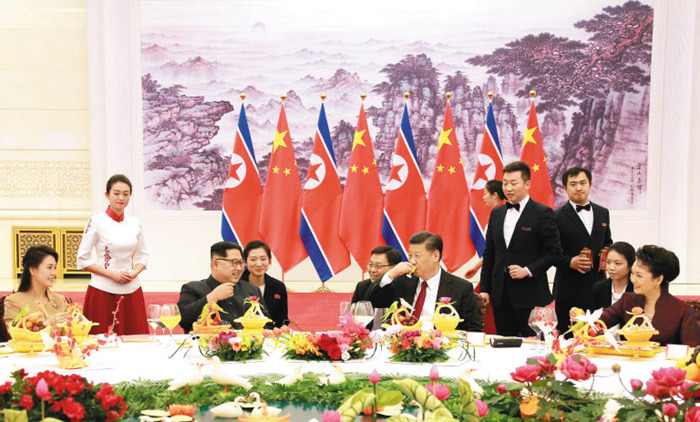 The following day, Xi and Chinese first lady Peng Liyuan invited Kim and his wife Ri Sol-ju to lunch, where Xi himself served tea for the North Korean couple like he did to Trump. When Moon visited for four days last year, he had just one state dinner with Xi, as China was going all out to signal its displeasure over the deployment of a Terminal High-Altitude Area Defense battery in South Korea at the time. Why Did Kim Jong-un Travel by Train? N.Korea Asks for S.Korea's Help in Softening up U.S.